The word Anatomy is defined in the dictionary as “a study of the structure or internal workings of something” and just like the human body, the Summit Charcoal Grill has internal workings that harmoniously work together in providing optimal performance at every level. It’s been a few months since Weber launched the Summit Charcoal Grill, and I thought it would be appropriate to explain a little more in detail how everything works together and to one more time, point out all of the amazing features of this grill. When you approach the grill and lift the lid, you first realize how easy it is with the Easy Open Lid Hinge and how beautiful the lid and bowl seal with the commercial grade lid gasket. To ignite the grill, simply scoop your fuel with the included charcoal cup and stack on your Two Position Fuel Grate. The beauty of having a two position fuel grate is that it gives you flexibility to move the coals up or down in the bowl depending on your application of cooking. (The owner’s manual actually tells you how many scoops depending on your method of cooking). After inserting a 1lb propane cylinder, you can easily light your fuel with the Snap-Jet™ Gas Ignition System. No lighter fluid or matches needed. A turn of the knob and you’re on your way. The Rapidfire™ Lid Damper is one of the most innovative components of this grill. This hinged lid damper acts like all other lid dampers in controlling and maintaining proper heat levels, but also adds the convenience of the hinge allowing you to flip it open, maximum air flow and acting like a gas pedal on a Ferrari. It’s like a built-in chimney starter that gives you so much flexibility whether you want high heat for searing, or when you want to move from low/slow to direct cooking. It’s an awesome invention that all other charcoal grills are jealous of and wish they had! This lid damper will get you up and running and grilling in 20 minutes! The insulation properties of this grill are magnificent, due to the innovative Air-Insulated Double-walled Lid and Bowl. Air is one of the best insulators around and our testing has proved that heat is trapped within the grill and cannot escape thru that “air barrier” allowing you to hold steady temperatures especially at long periods of time without any fuss. The Stainless Steel, Hinged Gourmet BBQ System™ Cooking Grate gives you so much flexibility and versatility. This cooking grate has huge hinges on the sides to aid you if additional fuel or woods are needed during cook times. The removable center allows you to insert any of the Gourmet BBQ System™ components. (click here to see all of the Gourmet BBQ System™ inserts). If you are smoking or grilling foods that typically use the indirect method for longer cook times, the Hinged Diffuser Plate will come in handy. This diffuser plate is air insulated as well, and is made of two layers of stainless steel welded together. The hinges make it easy to add additional fuel/woods if needed while in use. The diffuser plate sits on the center support ring and when not in use, can easily be stored underneath the grill. Clever! The unique Smoke/Low and Slow Vent Setting at the bottom of the grill is a new setting as part of the One-touch™ cleaning system. This setting allows just the right amount of oxygen into the bowl when smoking, so there is no guesswork. And removing ashes is as simple as swiping the blades back and forth, and removing the bowl to discard your ashes. The Summit Charcoal Grill operates like a well-oiled machine. 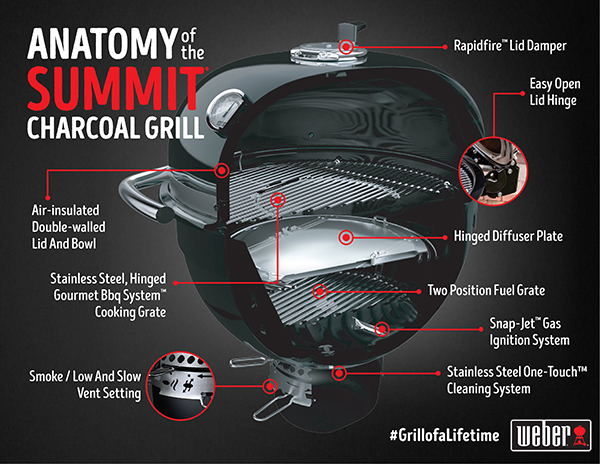 Understanding the anatomy of this grill hopefully gives you a better overview of this amazing product. Happy grilling!